THE second half of the Bathurst 12 Hour has seen multiple lead changes in a race where safety cars have yet again featured, constantly adjusting the flow of the race. While it was Augusto Farfus who led coming in to the final six hours, the next two hours would see the #42 end up outside the top five and some cars which hadn’t featured all day move well up the order. Early on in the second half of the race the #108 Bentley was able to jump up into first place, this time with Vincent Abril behind the wheel as the tail-gunner #107 entry, driven by Steven Kane, acted as a buffer to Martin Tomczyk in the #42 BMW M6. On its 158th lap the #91 Class I MARC Cars entry with Paul Morris behind the wheel stopped on the run up to The Cutting. After recurring problems throughout the day, including Anton de Pasquale suffering from fume inhalation, the car cried enough, pulling out from the class lead. The stopped car meant the safety car made another appearance for the day, triggering pit stops among the lead group which shuffled the order, making it cars #62, #912, #108, #77, #999, #18, #911, #42 and #75 in the top ten overall. Matthieu Vaxiviere led the pack to the restart on lap 173, putting a small gap on the field while Victor Abril had a crack at Dennis Olsen for second, going in too hot to Griffin’s Bend and losing the spot as soon as he’d gained it. Abril was able to get through with a repeat of the move on the next lap, moving to second as, at the top of the Mountain, Vaxiviere went straight ahead at Skyline, running through the run off area and retaining the lead, though losing time to Abril. Though the Bentley with Abril was much faster earlier in the stint, the #108 couldn’t find a way past the #62 Aston Martin despite their best intentions. Abril was eventually let past by Vaxiviere, opening up a sizeable gap quickly to try and offset the time he would spend in the pits due to stopping much earlier. DTM champion Gary Paffett came to a halt on his 185th lap, slowing on Mountain Straight before the #77 Mercedes-AMG GT3 shut down on the way down the hill with the Briton parking it up at Forrest Elbow. This meant the safety car featured again, hitting the track once more to pick up Vincent Abril’s Bentley while crews recovered the striken Mercedes and the #22 Audi R8 which hit the wall at Forrest Elbow. Racing resumed on lap 192 as the 911 and 912 Porsche’s led the way, 20 or so laps after their last pit stops. 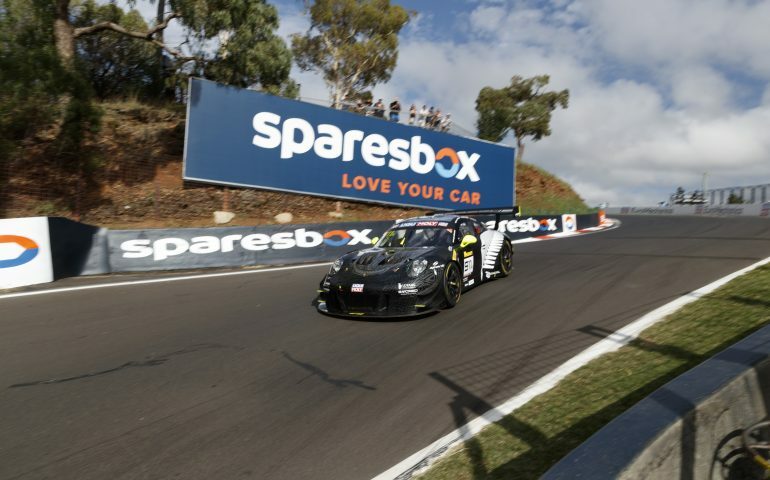 With two cars who were laps down between them and Alex Imperatori, Craig Lowndes and Thomas Jaeger, they had a chance early on to open a gap towards the end of the hour. Imperatori got past Olsen in the #912 entry quickly and soon found himself behind Sven Muller in the #911 Earl Bamber Porsche, wanting to take the lead away and put a Nissan GTR in front again at Bathurst though Muller kept dealing with the pressure, leading on lap 202.